With digital media becoming more and more popular, there is more content readily available. The more we are overwhelmed with information, the harder it is for us to focus on what is important. “Communication designers need to redefine their role and purpose for an expanded media context dominated by a many to many conversation mode.”  More and more, large amounts of information are becoming easier to obtain. Fortunately, there is a way to combat the presentation of complex data through data visualization and infographics. By now you’re probably asking, what is an infographic? What is Data Visualization, and why do they sound so similar? It is tricky to pinpoint each one because both terms are describing very similar kinds of communicative visuals and they could be interchangeable. Despite their subjectivity, both elements are essential in illustrating significant amounts of data. 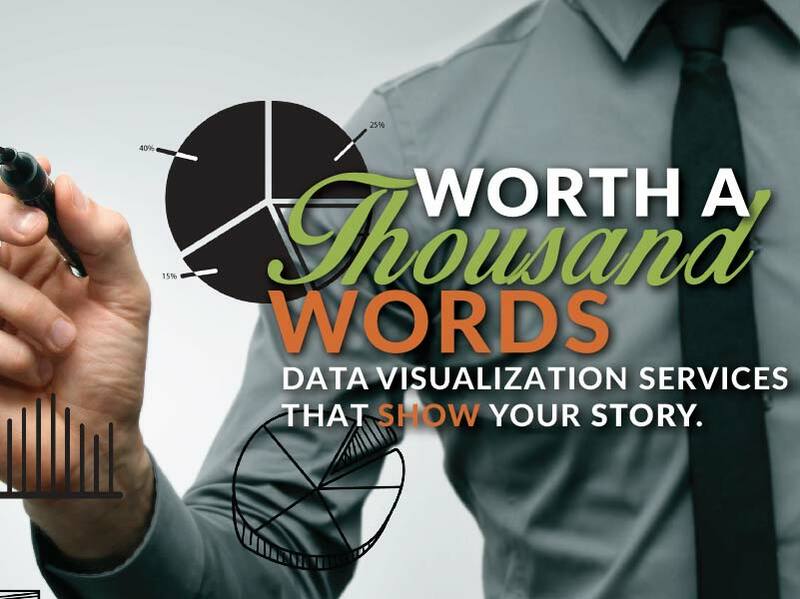 The data drives the creative of data visualization and infographics. Data visualization describes the combination of visual aesthetics and hard data to make a visually impactful presentation. It’s purpose and intent can be argued, as it is subjective to those who have used it. From my perspective, data visualization is more dependent on the data for it’s visual appeal. What makes data visualizations so interesting is the creative composition they are formatted in. There is no need for charts, graphs, or tables. The data does not have to be uniformly displayed. It relies on the use of data in a visually pleasing manner to present the material. From my experience, infographics are a mixture of graphics and information to share a story through data and information. Their composition relies heavily on story, aesthetics, and data. Infographics are generally more artistic with unique graphics based on the message being displayed. The graphics are equally as important as the information they are presenting. In some instances, the graphics are replacing the information completely. This is why infographics are more visually artistic because graphics are the main asset to their existence. It is difficult to clearly define each term since there are so many interpretations. I took a different approach to defining each. With no actual data to draw from, which is the purpose of these visuals, I figured I would compose what I instinctively thought an infographic and a data visual looked like. Now this experiment may be faulty since there was no actual data taken, but from a visual standpoint, there are differences. The infographic turned out to be a colorful pictorial. A story line could easily be created from this result. As for the data visualization, I found myself making very unspecific charts, graphs, and other traditional mediums for displaying information. The data visual did not follow a story or heavy graphic composition. These graphics could be interchangeable, but doing so would be difficult to execute. The infographic showed to be very specific in style and story, and using data visuals within the infographic might seem redundant. The entire piece is describing a certain process. Why would I need a data visual if all the data needed is composed within this single infographic? The infographic was becoming too specific in theme with the data I created, so it would be inconsistent with the data visualizations. My experiment concludes that infographics and data visualizations do have similarities but are their own entity. At the designer’s discretion, they are appropriate in various circumstances for displaying information. However, it is subjective. Deciding which format to use depends on how you define each term and on the intent of the data you want to present. If you have large amounts of data to analyze, or need to deliver a shared message, an infographic would be most appropriate. If you have one specific set of data with no other supporting information, data visualization would be most appropriate. “The idea is to create both aesthetic and functional data visualization in order to provide insights and intuitive ways of perceiving complex datah.”  Data visuals and infographics are useful for educating, promoting, informing, interacting, or selling. It is a kind of visual media that is informative and exciting to look at. They provide an artistic and concise solution to visualize complex data and information “Learning should be constructed in a manner enabling students to have more active role to discover, understand, interpret information and use it for its intended purpose rather than acquiring knowledge in a passive way.”  From a business standpoint, data visualizations and infographics can be extremely useful for selling a product or promoting an aspect of your business. You can inform potential clients while entertaining them. 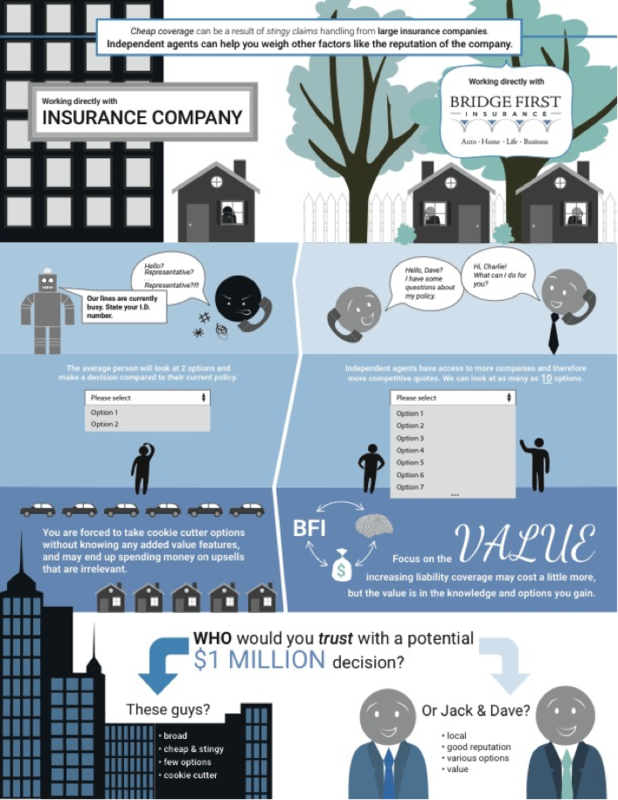 For example, CATMEDIA created an infographic for Bridge First Insurance to help explain the difference between working with an insurance agent vs. an insurance company. For potential clients, this infographic will catch their attention and drive them to other Bridge First Insurance media, such as their website. The infographic is extremely useful for new insurance carriers who are unaware of the benefits of having an insurance agent. Creating an infographic or data visualization is typically done by a graphic designer, or someone who understands the design principles. There is a large amount of research and analysis that needs to be done before visuals/graphics are created. The designer must fully understand the material in the original data format before interpreting the information visually and accurately in another composition. The outcome of data visualizations or infographics depends on the data analysis of the information and visual analysis to produce the visual interpretation. Data analysis involves the interpretation and conclusion of data. It is crucial in the planning stages of data visualization, as well as the outcome of the data from a visual standpoint. The planning stages of these visuals includes research and analysis of data. The data analysis gives the designer insight while creating the visuals. The composition, style, theme, and tone all rely on the intent of the data and the conclusions drawn from data visuals or infographics. Data analysis is essential in the process of creating these visuals. The images are not created first, which is important to remember. The viewer of the data visuals and infographics can also use data analysis for drawing conclusions from the outcome of the graphics. Your audience will learn more about the data as they interact or view your piece. 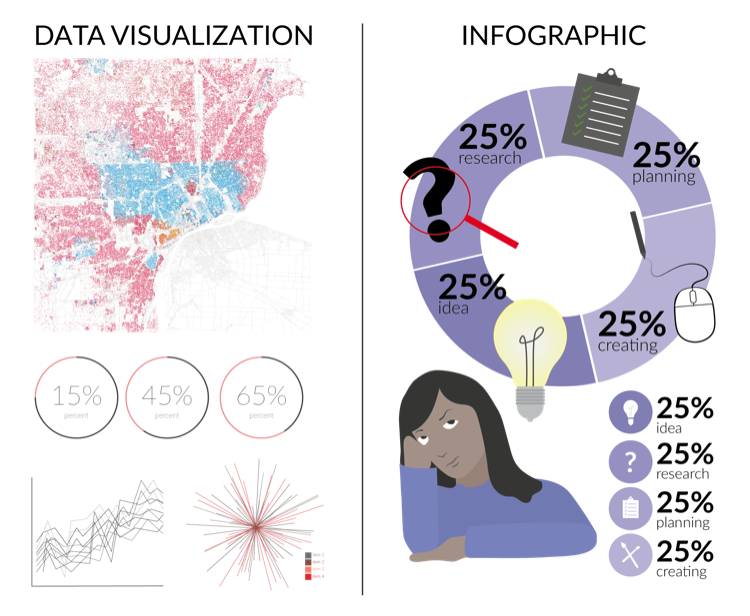 Similar to the idea of data analysis, a visual analysis is the process of observing, interpreting, and drawing conclusions from a visual medium. Visual analysis is extremely important when creating data visualizations, as well as drawing conclusions from the graphics made. As I mentioned above, data analysis comes first, but that doesn’t mean visual analysis isn’t also important. It might be more useful from an audience’s standpoint, since the graphics are secondary to the information. The graphics are mainly to entertain the viewer and give them another perspective to the data. The designer has already drawn conclusions from the data, so the viewer would use visual analysis to understand the piece. Where should I use it? Online or print? These kinds of graphics are generally used as digital media, but they are also prevalent in magazines, newspapers, or print campaigns. Data visualization is a great solution when data needs to be presented, but there is limited space to do so. By combining the information being presented with visual aesthetics, you will be able to present your data in a concise tone, thus saving space and over explanation, all while displaying data in a creative way! Data can be more impactful when visuals are involved. This however, does not mean that data relies on visuals, because the visuals are created from data. Data visualization and infographics allow for artistry and creativity to combine with information as the backbone. The way in which the data is presented is now an element of the data. The visuals are the dressing to the data salad. The visuals aren’t replacing the data; they are enhancing it. I believe these terms are subjective to the reason of their use, but that doesn’t mean one is more important than the other. Both are equally as important to concise information in an exciting and visual perspective. They can catch the attention of the viewer quickly, and keep them interested in the data for a longer period of time.